Recently, I was running a workshop that included people from eight different cultural backgrounds. As an icebreaker activity, I had each one of the participants come up to a whiteboard, write down their own name and tell us the story of their name. Some of the participants became very animated and talked about the heritage of their name, how their parents came to choose it, and how it was linked to different historical perspectives of their family. Other participants talked about how their names signified what number they were in the family hierarchy, which tribe they came from, and who their parents were. There was a whole host of fascinating reasons as to how each person�s name came to be their own. I was genuinely surprised by the amount of history, background and symbolism that could be contained in a single name. The point I would like to highlight is that each of our names has an unique story, whether big and symbolic or small and serendipitous. When you're travelling around the world as a global leader and meeting people from different cultures it is useful to have a number of icebreaker conversation starters up your sleeve. I suggest you add this one � asking the person what�s the story behind their name � to your repertoire. It�s not only an easy and comfortable question for the person to answer, but you will find most people enjoy telling others the story of their individuality. Also, this is a quick way to learn something new about a person and their culture. It is worth nothing that you don�t even have to travel to put this activity into practice. We all work or interact with individuals from different backgrounds, so why not test it out on your colleagues or associates. Even if you share a similar cultural background, you can always learn something new about a person from their name and at the same time exercise your own cultural intelligence skills. And one last thing, don�t forget to know what the story of your own name is! Newsletter Reader Question: My organisation has recently conducted a round of staff performance appraisals and we want to recognise the high-performers from each team. There are a number of different cultures represented among this group, and I want to make sure we are recognising these individuals appropriately. Do you have any advice? This is a common challenge faced by organisations with a diverse workforce. In collectivist cultures, sometimes it is embarrassing to be pointed out as a champion, or to be singled out as someone who has excelled and performed really well. The reason for this is because part of this person�s upbringing / psychological makeup is actually about belonging to the group. This is not so much a problem when you are recognising people who come from individualistic cultures, as they are very comfortable (in general) in terms of standing out and taking recognition. Here are a couple of quick tips for you to think about. If you have individuals who are from collectivist cultures and you want to recognise them, it's useful to provide forms of recognition that appeal to their collectivist nature. If you want to recognise the person publicly, it is appropriate to check directly with the individual first to ensure such a process is acceptable. The same is true for giving a reward � make sure it is culturally appropriate. One example of a popular gift is to provide a voucher that enables them to take their team or their own family out to dinner. This gives the person the opportunity to share their success with others. Conversely, with individualistic cultures, the process of measuring, recognising and rewarding team members is a much more acceptable and common practice. Recognition tends to given publicly for this reason. Examples of recognition can include rewards such as certificates, trophies, or a feature piece in the organisation�s newsletter � all items that help the person stand out as an individual. Beyond cultural differences, it is equally important to consider the individual preferences of each person. Personality is also a strong driver for public or private recognition, regardless of the individual�s culture. Sheryl Sandberg is the COO of Facebook and #1 New York Times best-selling author of Lean In: Women, Work and the Will to Lead. In 2015, Sandberg experienced a life-shattering event when her husband died unexpectedly while they were on vacation in Mexico. Sandberg felt that she and her two children would never feel pure joy again. In her new book, Sandberg teams up with Adam Grant, a psychologist from Wharton School, to chart the path she has travelled to recover and move forward after her devastating experience. The book combines Sandberg personal and inspiring insights about building resilience and rediscovering joy, with Grant�s illuminating research on finding strength in the face of adversity. 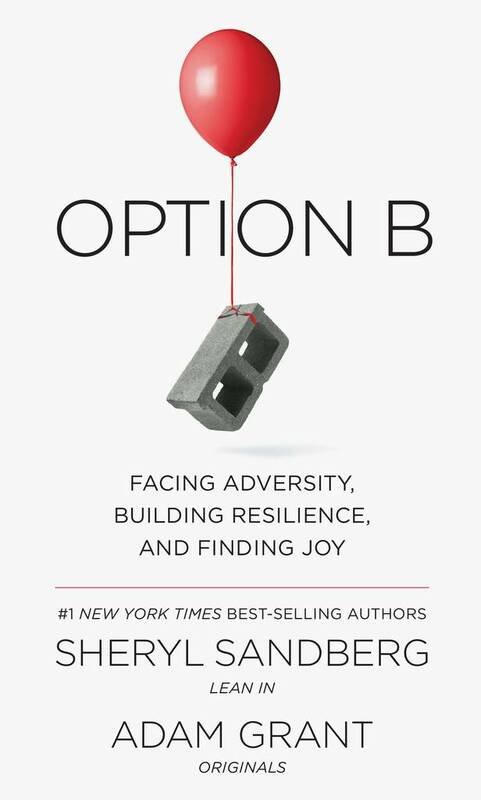 Option B also shares a broad range of stories outside of Sandberg�s personal story that explore the powerful human capacity for perseverance. These compelling stories highlight the potential for each one of us to find deeper meaning and gain greater appreciation in our lives, even in the face of tremendous hardship. The valuable lessons provided within this book help to reveal the ways in which we can help others in crisis, develop compassion for ourselves, raise strong children, and create resilient families, communities, and workplaces.